German Consulate In Northern Afghanistan Attacked : The Two-Way The Taliban claims responsibility for the attack late Thursday, which the group says was launched in retaliation for recent airstrikes in the city of Kunduz that killed dozens of civilians. 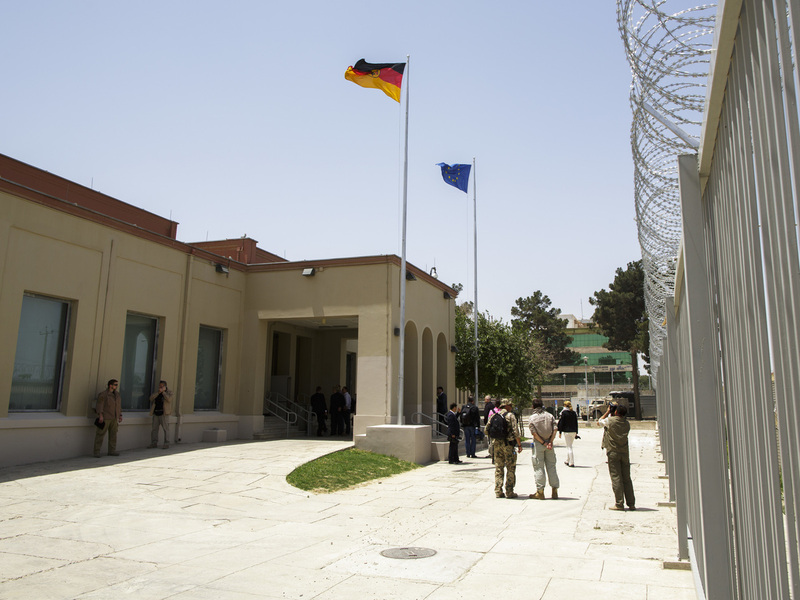 The German Consulate General building pictured in Mazar-i-Sharif, Afghanistan, shown before the attack. A suicide car bomber driving a truck rammed the gate of the German consulate in the northern Afghan city of Mazar-i-Sharif late Thursday. News media quote Afghan officials as saying at least two people were killed and dozens injured in the attack. The New York Times reports, citing a regional police zone spokesman, that there were two large explosions. The first blast initiated the attack and was followed by gunfire. The paper says another explosion was heard inside the compound. According to the BBC, the consulate sustained "massive damage" and NATO troops were evacuating its personnel. A Taliban spokesman, Zabihullah Mujahid, said his group launched the attack in response to recent coalition airstrikes in the northern city of Kunduz, according to The Associated Press. Dozens of Afghan civilians, including women and children, were killed in that operation which is under investigation. Germany has almost 1,000 soldiers in Afghanistan, largely for training and backing up Afghan security forces.